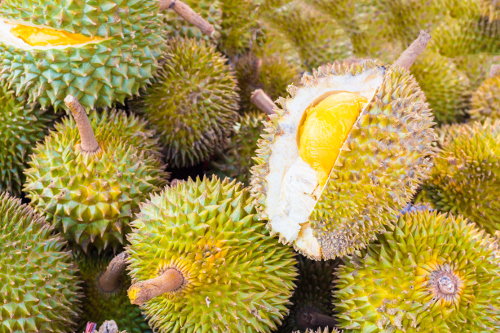 Durian fruit is one of those fruits that is kind of surprising we know anything about. It looks like it shouldn’t be eaten, as it’s covered in a thick husk of spines. Durian looks like it should be poisonous, or should be used as a weapon. Depending on what your sense of smell is like, durian can also smell horrible, like rotting meat, sour milk, or really good cheese. In fact, certain parts of the world where the fruit is popular, have banned it from public transportation due to the smell being able to make a whole bus gag. It looks mean, it can smell like spoiled milk, and it’s good for you. Durian has a lot of health benefits that make powering through the husk and spines worthwhile. Durian is filled with fiber (one cup of durian is approximately 27% of your daily fiber intake), which can keep your digestive system running well. Due to its high fiber content, durian can also help with your diet. As we previously mentioned, the fiber helps keep you regular, which can help with weight loss. It also can help you feel more full, so you eat less. Durian is very good for heart health. It’s filled with potassium, which can help keep blood pressure low. Durian carries with it a decent amount of tryptophan, a nutrient that can help you sleep. You may be familiar with tryptophan, as it’s the part of the turkey dinner that puts you to sleep at Thanksgiving. Durian carries with it a rather large concentration of iron and copper, a rarity with fruit. Iron and copper are very important for the creation of red blood cells. Those people who suffer from anemia should consider adding durian to their diet because of this. Durian comes with a ton of vitamin C (one cup contains 80% of your daily vitamin C requirements). Vitamin C helps boost your immune system and fight infection, promotes skin health, and helps your body protect itself from various cancers and Alzheimer’s disease. So despite the durian smell, you can see why this fruit is eaten. If you were just going by the health benefits above, you’re probably considering plugging your nose and giving it a shot. But as they say on TV infomercials, “Wait, there’s more!” as the nutritional content of durian is pretty ridiculous. There is a ton of good vitamins and minerals in durian fruit. Durian nutrition includes a high amount of vitamin C, thiamin, magnesium, iron, and copper among others. It’s part of the reason it’s called the “king of fruits.” Sure it smells bad, but it’s so good for you. And that’s only from one cup of raw durian. The nice thing about the fruit, is that it can easily be incorporated into other foods. Durian flavor base is added to candies and sauces to serve with fish. But like all things that are good for you, there are some side effects and issues with durian that you should be aware of, before you start buying the fruit by the caseload. Durian is an incredibly nutritious fruit. It has a ton of vitamins and minerals that are incredibly good for you in a relatively small amount of fruit. Unfortunately, durian does have a few side effects that you might want to consider before buying a durian tree. While some people find the durian smell okay to pleasant, a majority of people will find it gross to revolting. Remember at the beginning of this article, we mentioned that due to the smell, some places had banned durian on public transportation? We weren’t kidding. There are parts of Singapore that have signs warning people that bringing the fruit on board may result in fines. Durians are rather high in sugar, which may lead to complications if you are diabetic or pregnant. Durian is a very fat- and carb-heavy fruit. Now, while these are not animal fats and easier to absorb than animal and man-made fats, they are fats none the less. One cup of durian contains 22% of your recommended daily intake of carbohydrates. You should keep this in mind before adding the fruit to your diet. Other issues with durian include the fact that it has a very short growing season. Durian season tends to last for three months—June until August. This can limit its availability, and also affect its cost. Durian Is Stinky, but Packed with Goodness! Durian are large, ugly, and rather smelly fruits. They only grow for three months, and can become pricey depending on the season. That being said, if you can get through all of that, they are really good for you. They are filled with nutrients and health benefits that may make pushing through the smell a little easier. Just remember to keep an eye on the amount you eat due to the high-carbohydrate and sugar levels. And if you can, when you buy one, avoid bringing it home on a public bus or subway train.